Some people reach their peak potential just once. You can get there over and over again (30 times to be exact) with the power of SNIPER on your side. Be admired as you climb your way to the top. Sure, it might get lonely … but the view from above? It’s 100% worth it. SNIPER utilizes Lion’s Mane, an up-and-coming ingredient in the world of sports nutrition, to enhance cognition and improve your sense of focus. We’ve also included theanine to promote increased attention so you can narrow your focus and hit your mark. SNIPER starts by giving you a full charge … but a complex or difficult training session quickly drains your power. With taurine and electrolytes, you can minimize physical exhaustion, dehydration, and cramping – applicable even to the most high-intensity workouts. If you ever find your strength wavering, dehydration may be at play. SNIPER provides electrolytes so that your muscles and nerves can fire at optimal levels for high performance. Electrolytes also support hydration, which improves your cellular function & blood volume. Your physique is nothing short of flawless. Stay ripped with SNIPER – no artificial colours, no fillers, just cold, hard power with every scoop. Quality ingredients are what you need to make a habit of winning and with SNIPER, you get exactly that. The roadblock that prevents you from lifting to your 100% FULL potential? Poor blood circulation. Citrulline helps dilate your blood vessels so more oxygen and nutrients can reach your hungry muscles. And with improved blood circulation comes more skin-tearing pumps. You’re a smart competitor - you’re probably wondering why we don’t include Creatine in our formula when others do. Creatine requires every day use to truly work. We’ve included 2.5g of Betaine in it’s place to get the same benefits without the need for a long loading phase. The tagline for beta-alanine that all gym rats know – with beta-alanine you get one more rep, plus another. This is exactly what you need when you’re nearing the end of your workout and need a high burst of power to finish on top. 3.5g does the job right. How is SNIPER different from other beta-alanine products on the market? 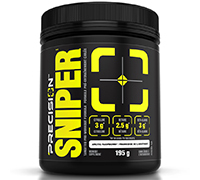 SNIPER is a targeted pre-workout designed to help you break each and every barrier on your path to victory. Barriers in the PICK-UP phase (like fatigue) are knocked out with caffeine and theanine. In the OUTPUT phase, hurdles like sub-optimal blood flow and dehydration are overcome with citrulline and electrolytes. Struggles all athletes experience in the WILL phase such as mental blocks and anxiety are targeted with lion’s mane and ashwaghanda. And finally, we’ve included ingredients like beta-alanine and taurine to help with stress hormones and lactic acid build-up in the RESILIENCE phase. Unlike energy drinks and other pre-workouts, with SNIPER you get a surge in energy without the crash. How? Theanine. Theanine works synergistically with caffeine to take the edge off its crash-inducing effects without compromising efficacy. This allows for a combination of narrowed focus and high energy. In other words, SNIPER takes you up…and keeps you up. We recognize that you’re a committed athlete who doesn’t cut corners – you want your gains to come from hard work and hard work alone. Integrity is just as important to us. That’s why all of our supplements are manufactured in a Health Canada site-licensed facility that is 100% free of banned substances. Is SNIPER safe to stack with other products in the Performance Series ? Absolutely. Stack SNIPER with AMINO-PLX and I-PLX to increase performance even further. Is there an age restriction I should be aware of ? SNIPER is safe for adults above the age of 18. When is the best time to take SNIPER? Take SNIPER 15-30 minutes before exercise. Consume up to twice daily with each dose separated by at least 3-4 hours. Ensure to drink plenty of fluids before, during, and after exercise. 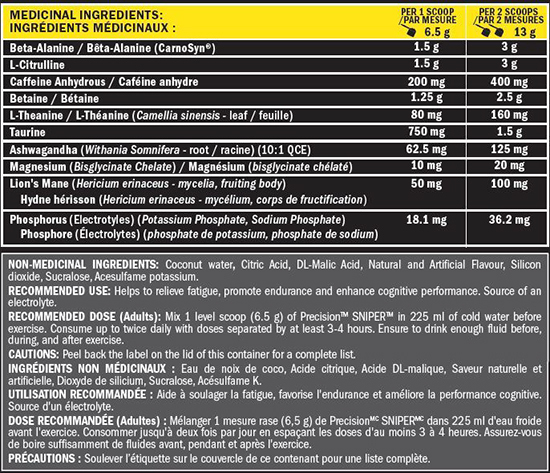 Recommended Dose: Mix 1 level scoop (6.5 g) of SNIPER in 225 ml of cold water before exercise. Consume up to twice daily with doses separated by at least 3-4 hours. Ensure to drink enough fluids before, during, and after exercise.